In response to the power outages experienced by our members following storm Ophelia, Dairygold have partnered with MacGen to source high quality generators at attractive prices, with the aim to providing a back-up power source for our milk suppliers. Dairygold & Teagasc will be hosting a joint programme information evening on back-up generators. This will be held at the Corrin Event Centre, Fermoy, starting at 7pm on Tuesday 21st of November 2017. MacGen, on their range of generators they offer. An electrical expert, who will explain how to properly set-up a generator on your farm. Teagasc/Dairygold, who will advise on the animal health impacts of reduced milking. Farmers will also have the opportunity to inspect generators on the night and discuss their on-farm power requirements. 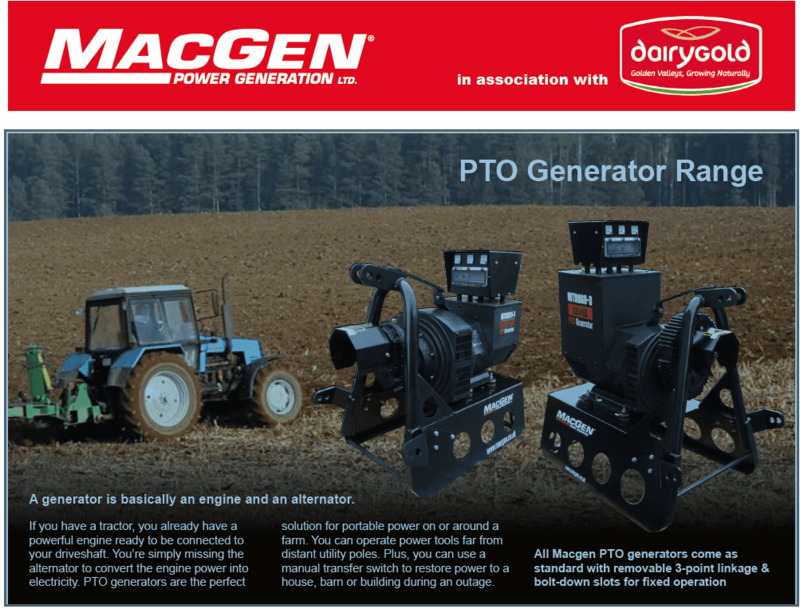 MACGEN offer a comprehensive range of generators suitable for agricultural use including easy to use PTO Generators which come with a 2 Year Guarantee and Removable 3-Point Linkage, Bolt down Slots for Fixed Operation, PTO Shafts & IP67 Plugs as Standard. The local sales representative for MacGen – Tomás Corr – is a qualified electrician and as such is able to give the best possible advice. MacGen will also be running information days in Dairygold stores in the month of November. Remember around the farm, it’s not just for milking cows and cooling milk that the electricity is required for – it’s also needed to supply water to fields/sheds, automatic scrapers, water heaters, lights, calving camera’s, electric fences etc.